This “release” includes the latest version of the animation and the instant-preview performance work, plus there are a number of stretch goals from the Kickstarter already available, too. And it is a major upgrade of the core technology that Krita runs on: from Qt4 to Qt5. The latter wasn’t something that was a lot of fun, but it’s needed to keep Krita code healthy for the future! Whatever may come, we’re ready for it! The port to Qt5 meant a complete rewrite of our tablet and display code, which, combined with animation and the instant preview means that Krita is really unstable right now! And that means that we need you to help us test! Another little project was updating our build-systems for Windows, OSX, and Linux. We fully intend to make Krita 3.0 as supported on OSX as on Windows and Linux, and to that end, we got ourselves a faster Mac. Download the zip file. Unzip the zip file where you want to put Krita..
Run the vcredist_x64.exe installer to install Microsoft’s Visual Studio runtime. Then double-click the krita link. If the entire window goes black, disable OpenGL for now. We’ve figured out the reason, now we only need to write a fix. It’s a bug in the Intel driver, but we know how to work around it now. Download the DMG file and open it. 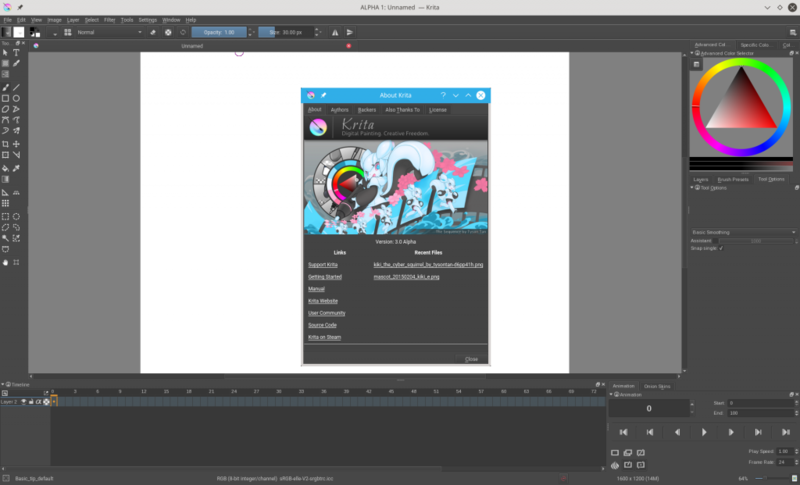 Then drag the krita app bundle to the Applications folder, or any other location you might prefer. Double-click to start Krita. We built Krita on El Capitan. The bundle is tested to work on a mid 2011 Mac Mini running Mavericks. It looks like you will need hardware that is capable of running El Captitan to run this build, but you do not have to have El Capitan, you can try running on an earlier version of OSX. You will not see a brush outline cursor or any other tool that draws on the canvas, for instance the gradient tool. This is known, we’re working on it, it needs the same fix as the black screen you can get with some Intel drivers. For the Linux builds we now have Appimages! These are completely distribution-independent. To use the AppImage, download it, and make it an executable in your terminal or using the file properties dialog of your file manager,Another change is that configuration and custom resources are now stored in the .config/krita.org/kritarc and .local/share/krita.org/ folders of the user home folder, instead of .kde or .kde4. On some distributions or installations, you can only run an AppImage as root because the Fuse system is locked down. Since an AppImage is a simple iso, you can still mount it as a loopback device and execute Krita directly using the AppRun executable in the top folder. We implemented a “Drop Frames” mode for Krita and made it default option. Now you can switch on the “Drop Frames” mode in the Animation Docker to ensure your animation is playing with the requested frame rate, even when the GPU cannot handle this amount of data to be shown. Show the current frames per second (fps) and whether the frames are dropped in the tooltip of the drop frames button. Fix crashes with cropped animations, the move tool and changed backgrounds. Frames import: Under file->import animation. This requires that you have removed the krita.rc in the resource folder(settings->manage resources->open resource folder) if you had a previous version of Krita installed. Only has a filebrowser that’ll allow you to select multiple files for now, but we’ll enhance the UI in the future. We rewrote our tablet handling. If tablets didn’t work for you with 2.9 or even crashed, check out the 3.0 branch. Move increment keys for the move tool! This is still under development, but we are sure it’s basic form is appreciated. We removed the ‘move in/out of group layer’ buttons. Moving a layer up and down will also pass it into the group. Ctrl+Shift+G will now have the currently selected layer put into a group with a alpha inherited layer above it, not unlike Photoshop clipping masks. Our shortcut system is now ordered into groups. You can now save and share custom versions of your shortcuts. Krita now has Photoshop and Painttool Sai compatible shortcuts included by default. You can now switch the selection modifiers to use ctrl instead of alt. Useful if you are on Linux, or prefer ctrl to alt. Add import/export of GBR and GIH brush files, generating from animated .kra files is still coming. Show editing time of a document in the document information dialog, useful for proffesional illustrators, speedpainters and other commision-takers. It detects when you haven’t performed actions for a while, and has a precision of +- 60 seconds. You can empty it in the document info dialog and of course by unzipping you .kra file and editing the meta-data there. simple color selector now has white on top and black on the bottom. Added a Smudge_water preset to make smudging easier. With that in mind, it shouldn’t be surprising that we don’t recommend using this version for production work! Right now, Krita is in the “may eat your cat”-stage… But it is sure fun to play with!